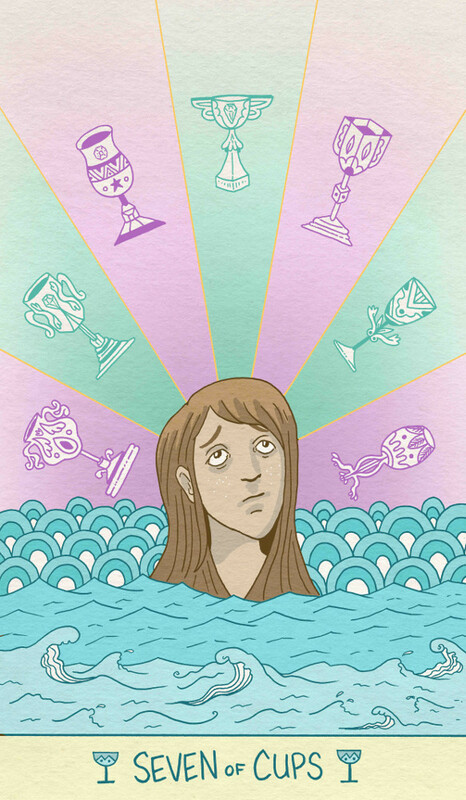 The Minor Arcana are usually fairly clear with regard to whether circumstances are pleasant or otherwise, but the 7 of Cups sits in a rather awkward position. It is almost alluringly uncomfortable. To explain this, let’s look at contrasting classical decks and see what line The Luna Sol Tarot strikes. For a slightly different angle, let’s turn to the ever controversial Aleister Crowley, who, when naming this card in his and Lady Harris’s Thoth deck, went for the word “Debauch”. If you were seeking guidance, then it sounds like someone disapproves of your decisions. For clarity, let’s look at what Crowley said: “This is one of the worst ideas that one can have; it’s mode is poison, it’s goal madness”. No ambiguity there! In the words of Lon Milo DuQuette in his brilliant Understanding Aleister Crowley’s Thoth Tarot, “The Seven of Cups is a stumbling dash to the lavatory just moments after you thought you were being irresistible to an attractive stranger”. Why so negative? The astrology association of the card is Venus in Scorpio, and the Qabalistic association is Venus in Netzach. If you have a bit of astrology knowledge, maybe the Venus/Scorpio connection starts to make sense of Crowley’s view of the card. But what of the Qabalistic connection? A simple introduction to Qabalah and how it relates to the tarot is most certainly promised for a future blog, but, for now, let’s focus on what matters here. One of the main diagrammatic representations of the Qabalah is the Tree of Life: 10 spheres, or “sephiroths”, connected by 22 paths. Each sephiroth has its own associations (i.e. colours, numbers, astrology). The planet associated with seventh sephiroth, Netzach, is Venus. So the 7 of Cups is Venus in the sephiroth associated with Venus. That sounds like a good thing… but it’s actually too much of a good thing! Just like the fantastical thoughts described above are a bit out of control, this is one pleasure too many; it’s false pleasure and, possibly, addiction. By the time you’ve hit the seventh cup, it’s time to take a well-needed break. So what of The Luna Sol Tarot’s 7 of cups? To me, it strikes a path between the two above cards. The fantastical chalices still float there, with something not-quite-solid and illusory about them, grabbing the observer’s attention. This goes back to the Waite-Smith’s hovering cups, but emphasises how these objects are constructions of the mind – something additional is needed to make them real. The observer’s expression seems to show how the mind is enthralled by its own creations, but the slight queasiness speaks to Crowley’s over-consumption. 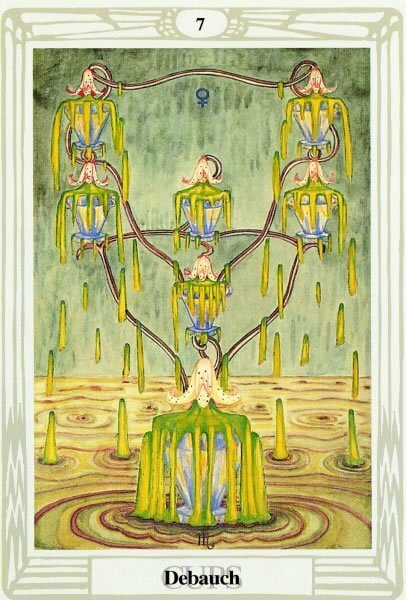 Water, an element associated with both Cups and Venus, has risen high, reaching the figure’s shoulders, becoming something that binds. What initially started as a nice dip has become turbulent, and there is a need to take compensating action. Your mind is creatively strong and many options are presented to you as a result. Bring focus to reality and think about how you can move your ideas into action and consider where they should be abandoned. Review aspects of your life that might have been enjoyable once but now have gone too far. 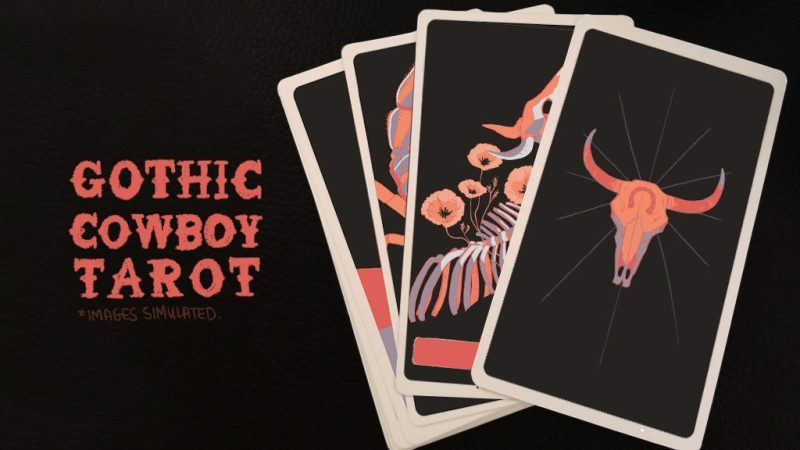 I wanted to bring your notice to a Kickstarter I recently backed, The Gothic Cowboy Tarot Deck by Kit Kellogg. That might sound like a strange theme, but, when you look at marvellous art on the cards, you can quickly see how this works. Kit has kept the style simple and the colour palette restricted, but the quality is all the stronger for it. The theme isn’t the only unusual thing here; this a 40-card deck that Kit has described as being just the Major Arcana. The deck size and structure sounds like more of an oracle card deck, and the four cards shown in the Kickstarter obviously differ from traditional tarot representations, but Kit has clearly taken the tarot as a starting inspiration. There are still two weeks to go (at time of publishing this blog post), and the funding target has been reached, so please go on take a look at a deck that we think is well worth backing. On the subject of Kickstarters: Next week we will be looking at our top 5 tarot decks that are out of print but which we dearly wish were not! It can be a difficult decision for tarot creators to consider whether or not to do another print run, especially if they don’t have the backing of a publisher. Even with a pre-order or Kickstarter system, where you have some idea of the demand, the creator still has to dedicate considerable time to establishing and running the campaign. This is a chance to send some love to those who took the initial risk and give support should they consider doing so again. Until then! 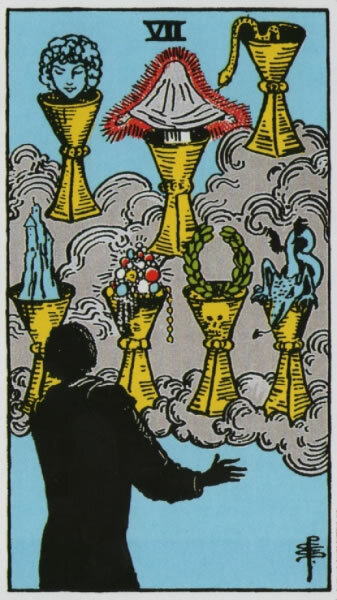 Please do tell us what you think of our 7 of Cups in the comments, or on our social media pages. Previous Post How do I get into tarot?